These two to continue to laugh last when it comes to pension reform. To read the self-congratulatory remarks uttered by many of our most prominent elected officials, you'd think they really did something courageous yesterday, when the General Assembly passed Mayor Emanuel's pension bill. Essentially, their comments went a little like this . . . In regards to pensions, mistakes were made. But now is not the time to talk about the past. Now is the time to talk about how great we are in holding all of us accountable for those past mistakes. Just to remind you, this is the main mistake that was made. Our elected officials promised to make regular payments into the pension funds for cops, firefighters, teachers, etc. But instead of making those payments, the leaders spent that pension money on other things. Then they hailed themselves as masters of municipal financing, while the pension funds slowly headed toward bustville. Which, I believe, is a dump somewhere outside of Detroit. Now they're holding the cops, teachers, firefighters, etc, accountable by cutting their pensions, even though they didn't do anything wrong, other than trust the leaders in the first place. And they're holding voters accountable by jacking up our property taxes, even though we didn't do anything wrong—well, apart from electing and reelecting and re-reelecting these same old officials. As for the leaders who actually made the mistakes—how are they being held accountable? Well, let's take it case by case, starting with . 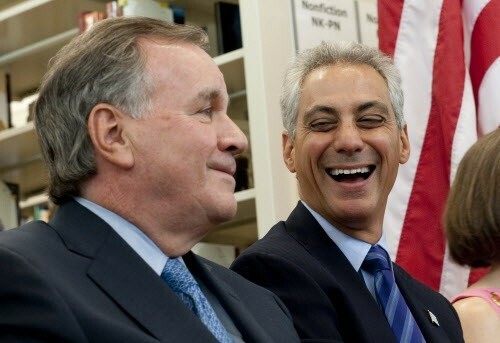 . .
Mayor Richard M. Daley—the emperor when all those mistakes were being made. He'd probably still be emperor, if he hadn't gotten sick of running the empire. He's now a lecturer at the University of Chicago (TIF recipient), a lawyer with Katten Muchin Rosenman (which advised the city on the parking meter deal), and one of the principals in a consulting firm he set up with his son. So obviously he's doing fine. Paul Vallas and Gery Chico—the tag team Daley appointed to run the Chicago Public Schools in 1995, right around the time the state passed a law that allowed CPS to stop making annual payments to the teachers' pensions. Which is pretty much mistake number one when it comes to that particular fund. Vallas set up his own consulting firm and now gets other school districts to pay him for advice on how to run their schools. Which just goes to show you that P.T. Barnum was right. Oh, yes, Vallas is currently Governor Quinn's running mate in the upcoming gubernatorial election. Meanwhile, Chico runs a law firm that, among other things, offers representation on zoning requests and TIF deals. He's also the chairman of the Illinois State Board of Education. In that capacity, he had a letter published in today's Sun-Times calling for more state funding for the public schools. Tell you what, Mr. Chico, before we start raising more education taxes, how about spending the school taxes we already pay on, you know, schools! As opposed to diverting the money to things like a Marriott hotel, DePaul basketball arena, and other TIF deals. Bruce Rauner—he's the gazillionaire whose private investment firm made gazillions managing the Illinois teachers' retirement system. Now he's the Republican gubernatorial candidate who wants to cut, cut, cut retiree pensions. If geezer teachers have to take a cut, the least Rauner can do is return the money his firm made in the pension business. Michael Madigan—as house speaker, he pretty much controls every law regarding everything, pensions included. In fact, you might say that the law he passed yesterday was an attempt to rectify the problems caused by the laws he previously passed. He also runs a law firm that represents the owners of high-priced downtown property in their appeals to the county for property tax cuts. I'm sure business will be booming when the mayor raises property taxes further to pay for "pension reform." Aldermen Ed Burke and Patrick O'Connor—they were, respectively, chair of the City Council's finance committee and mayoral floor leader during much of the Daley era. They're still finance chair and mayoral floor leader. Plus, Burke has his own property tax law firm on the side. 'Nuff said. Mayor Rahm Emanuel—OK, he was off in Washington for most of the Daley years. But he had his lips firmly planted on Mayor Daley's derriere , so the mayor felt free to make his many mistakes without fear of political retribution—and did. Mayor Emanuel maneuvers to save his slush funds.